The great Jazz drummer Art Blakey once said “…it takes an intelligent ear to listen to Jazz”. So what is Jazz improvisation and where does it come from? In this kid friendly concert, Unit Structures breaks down the fundamental elements of Jazz improvisation for an interactive audience experience that will deepen the Jazz intelligence of all ears – young and old. “music should always be an adventure… and if you don’t make mistakes, you aren’t really trying.” – Coleman Hawkins. 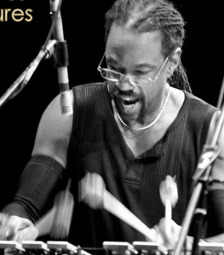 Unit Structures is a 9 piece jazz ensemble, originally founded by drummer and music educator Mr. Wade E. Barnes (1955 – 2012) and now under the leadership of Bill Ware. In the mid 1990’s Barnes established The Brooklyn Four Plus One, Inc. (B4+1,Inc. ), a 501(c)3 (nonprofit) organization whose mission is to bring the highest quality of “America’s classical music” to all ages, races, ethnic groups and socioeconomic levels. The B4+1 eventually expanded to the 17 member band, the Brooklyn Repertory Ensemble (B.R.E. ), and Barnes also formed three smaller ensembles comprised of B.R.E. members, including Wade Barnes and Unit Structures, Wade Barnes and the Bottom Line, and The Word On The Street. All of Barnes’ ensembles are comprised primarily of native Brooklynites deeply rooted in America’s musical culture. Barnes’ ensembles conduct performances, clinics and symposia for a variety of audiences, with the mission to promote a greater working relationship between the arts and education communities. Today, that mission continues for Unit Structures under the leadership of Bill Ware, vibraphonist.